John, highly respected among his peers for his well-crafted original songs, has a special talent for interpreting aspects of Australian history and environment through song. Several years ago, John heard of the little-known story of a Wiradjuri man called Yarri -- and after a year or so of research and collaboration, he produced a folk cantata or song and verse cycle he called Yarri of Wiradjuri. In June 1852, a massive flood demolished the original township of Gundagai which was then built on the Murrumbidgee floodplain. Eighty-nine people are known to have lost their lives. The Wiradjuri people — with their knowledge of the land in all its moods — saved the lives of many Europeans. This story tells of one such hero, Yarri, who was one of the first on the river, in the deadliest conditions at the height of the flood, in only a bark canoe. Yarri's is one of the most dramatic stories of Aboriginal-European interaction and certainly one of very few from an English perspective in which the Aboriginal people are clearly shown in a heroic light. While the story is well known in the Gundagai region, it not as widely known as it deserves. John Warner heard of the flood and Yarri's heroism in 1997 and began writing the series of poems and songs that make up the cycle using the English traditional folk styles he knows best. John collaborated with singing partner, Margaret Walters, in writing the piece. During the process, they consulted with many Indigenous people, particularly the Elders from Brungle where Yarri came from. Many of the characters in the musical are based on historical sources; others — the Mother and the Daughter — are river spirits from the author's imagination. The song and verse cycle Yarri of Wiradjuri acknowledges Indigenous ownership of the land and recognises several aspects of European culpability in their dispossession. Most importantly, it celebrates the Aboriginal people as heroes, and contributes to our shared history. Indigenous performers Matthew Doyle and Marlene Cummins have joined John and Margaret in performance of Yarri, as well as members of the Roaring Forties and Wheelers and Dealers. When it was shown at Gundagai on the 150th anniversary of the flood in 2002 it was warmly received by the people in the region by people who saw it as a positive vehicle for reconciliation — including Senior Wiradjuri Elder Flo Grant and Pastor Cec Grant, Wongamar OAM. The central characters were selected from the published material available at Gundagai. The businessman, John Spencer, was a brewer, pharmacist, storekeeper who had a punt for hire. With an unerring eye for the main chance, he dispensed with everything, including his clothes, when he swam for his life -- but not his cashbox! Thomas Lindley - known as Long Tom, owner of Rose Inn, wool grazier - lost all his family during the flood. Tom subsequently remarried and became a prominent character in Gundagai. His descendants are still significant figures in the local community. Saddler Richard Hunt, his wife Sarah, and their three children stood out from the list of dead because they were a family lost together in the flood. John fictionalised some of what is known to highlight the conflict between staying on the floodplain for trade and moving to higher ground for safety. The story needed some way to dramatise the flood as an active adversary. The author gave the river a female personality. Since both the Murrumbidgee and its anabranch, Morley's Creek, were the vehicle of the flood, John depicts them as spirits, the Mother and the Daughter. This made supernatural elements possible in the story and creating an opportunity for a dramatic discussion about the differences between European and Indigenous values. Yarri -- a Wiradjuri man from Brungle -- worked as a shepherd. 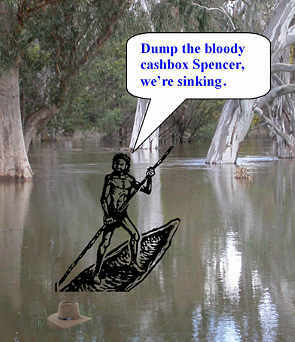 He, Jackey, and other Wiradjuri, saved the lives of reputedly 49 Europeans during the 1852 flood. The European settlers were very grateful to Yarri and Jackey and presented them with inscribed bronze breastplates in recognition of their bravery. Some years later -- in 1875 -- Yarri was baptised as James McDonnell. He died in 1880 and there are several memorials to his honour in Gundagai. Jackey was an employee of Joseph Andrews and credited with saving at least 20 lives during the flood, using a rowing boat in the style of a bark canoe. 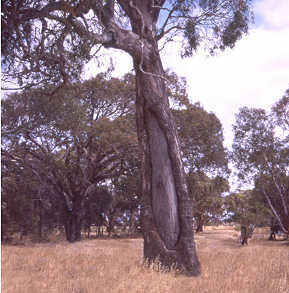 Black Sally, Yarri's wife, died on walkabout in 1902. We only know Yarri by his actions, and thus the recurring song, Yarri of the River, asks: "Yarri, what kind of man were you?" Yarri speaks for himself and his people only once - in the song Reward -- a stark statement about the impact of European settlement and culture on the Wiradjuri people and their land. The cast for this new production comprises the author, John Warner, plus Robin Connaughton, Jennifer Lees, Tom Hanson, Margaret Walters and Don Brian. Although most of these are members of the acapella group The Roaring Forties, the presentation draws on the instrumental skills of John, Robin and Don. As with most songs chosen by the group, strong harmonies and choruses abound with opportunities for audience participation. We are very grateful to the SEARCH Foundation for funding assistance, and to Christina Mimmocchi who made a nine-year-old dream come to fruition; to the late Pastor Cec Grant, Wongamar OAM, Senior Wiradjuri elders, Flo Grant, Vince Bulger, and other members of the Indigenous community around Gundagai who talked with John and Margaret during the creative process. All those involved in the production of this CD were extremely generous with their time and talents, especially the members of the Roaring Forties. Thanks are due to many others including: Gordon and Helen Lindley, Bob Gilholme, Peter Batey, Pat Sullivan, Allen Crooks, Fay White, John Dengate, Alex Rivers, Kim Poole, Robert Davidson, Nancy Kerr, James Fagan, Bob Fagan, Grace Karskens, Rae Frances, Bruce Scates, John Shields, Julie Kimber, Chris Maltby, Sue Brian, Pam Merrigan, Ged Corbin, Marlene Cummins, Cassia Lindsay, John Ross, Patricia Early, Wayne Richmond, Maggie Huang, Blackwood, Emery Schubert, Greg White, David Begg, Kevin Davidson, Lamar Lower, Eastside Arts, Tony Eardley, Sarah McDonald, UNSW School of Music. As an Englishman, songwriter and poet with a passion for the myths and legends of the Northern Hemisphere, I was amazed when I first heard of the story of Yarri. At another place and time, his heroism would have become folk lore, thrilling generations of people. I was inspired to write about the event, but obviously could not do so from an Australian Aboriginal perspective and chose the forms I understand best -- British folksong and poetry. The work also gave me an opportunity to make my personal apology to the Indigenous people of Australia for their dispossession. The Anglo Saxons celebrated the deeds of heroes in epic verse, the best known example being Beowulf. They had a formal poetic metre and some of the songs in Yarri, eg Murrumbidgee Water, use this metre. The work was conceived as a song and verse cycle, rather than a staged presentation, with the events made clear and characters delineated by words and music only. John was visiting my home in Sydney in 1997 when he received a phone call from Fay White, a fellow songwriter with a keen interest in ecology. Fay had been attending a Land Care conference in Wagga Wagga and had heard about the Murrumbidgee flood of 1852 which destroyed the original township of Gundagai. Apparently, the indigenous people had warned the white settlers about the likelihood of major flooding. Fay learned of the heroism of Wiradjuri people who had saved the lives of many Europeans. This was a tale of epic proportions which Fay felt John could do justice to. I could hear John's excitement mounting as he heard the story and soon he'd taken himself down to Gundagai to get the lay of the land, walking the surrounding hills, looking at the river and the last remaining building from the time of the flood, and picturing the devastation caused when massive logs and debris were borne down the river in that fearful torrent. John absorbed the local stories, viewed the resources in the museum, talked to indigenous people, and families whose forbears had been affected by the flood. John came to Australia at the age of 10 in 1960, settling in Leongatha, southern Victoria. Neither his English nor Australian education taught much about Aboriginal culture as it focused mainly on English politics. Two strong aspects of his upbringing were folk music and poetry, the primary influence coming from his mother who would sing or recite with no provocation at all. John's interest in writing included the works of Kipling, Tennyson and the poetry of the Vikings and Anglo Saxons. Lawson and Patterson were accumulated in Australia. Add to this a hands-on interest in blacksmithing, traditional crafts and industrial archaeology, and we have the roots of John's writing. Although John began writing songs in his university days, it wasn't until the early 1990s when he was working as a volunteer at the Coal Creek historical mining village in Gippsland, Victoria, that Australian history really seized his imagination. From this period come the songs which are recorded on the CD Pithead in the Fern. These songs - Anderson's Coast, the Miner's Washin', Dear Diary, Fires of '98 etc demonstrate John's remarkable skill with words, his fascination with tools of trade, his powers of observation, his ability to conjure up landscape as it was 100 years before, his imaginative story telling, his touches of humour, and his sensitivity to all sides of a story. John is objective, but asks the hard questions - as he does in the song Where Have the Kurnai Gone? John sometimes draws his tunes directly from traditional folk themes, Great Southern Navvy, for example, but mostly they are quite original - the result of steeping himself in many musical genres. So in 1997, when John came to write the story of the Gundagai flood, he brought all his skills and experience to bear in what he saw as a song and verse cycle - a folk cantata. The story unfolds like a Greek tragedy - you meet Richard and Sarah Hunt - hear them discussing the warnings of the flood and their decision to move to higher ground in July - but we know the flood is coming in June and that this family will not survive. And then there is Yarri, a man whose deeds should be common knowledge like those of Simpson and his donkey. John uses the Anglo-Saxon tradition of singing the deeds of the hero, emphasising the magnitude of Yarri's response. John is not a romantic writer; he is not thinking here in terms of a "noble savage", he is using the media he knows best to celebrate a hero whose deeds should be honoured, whatever his race. It has been suggested that Europeans have no right to tell the story of a Wiradjuri man. John would point out that the central protagonists in this story are all British. 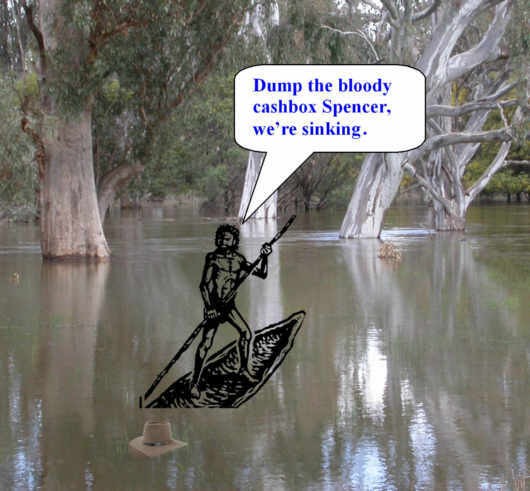 The Wiradjuri lose nothing and gain much by having an Englishman tell, in English words to an English-speaking audience, the story of English ignorance, racism and stupidity and the generous and unimaginable heroism of the Wiradjuri. John saw his writing as his apology to the Aborigines of Australia and he puts the case very powerfully in the song Reward. The penultimate song - Building Bridges, is a compelling statement about reconciliation. This is a story of shared history and it is to be hoped that John's telling of the story is but one interpretation of a tale that should be told again and again. During the process of writing the songs, John and I sought advice from people at the Koori Centre at the University of Sydney, representatives from various Aboriginal Land councils in Sydney and in Tumut/Brungle. Late in 1999, I accompanied John to Gundagai and we met with Vince Bulger, a Wiradjuri elder, to ask him if we were on the right track. He said that if this was about Yarri, then it was good for Gundagai and good for the Wiradjuri people. Flo Grant has been another senior Wiradjuri elder who has been very supportive of the project. There have been several live performances over the years, mostly at folk clubs around Sydney and at festivals, notably the National Folk Festival in 2000. In 2002 on the occasion of the 150th anniversary of the great flood we had our biggest production in Gundagai. Pam Merrigan worked with a team from Gundagai to stage a performance that included some indigenous people and many school children from Gundagai. In 2005, encouraged by an invitation to perform the piece again in Gundagai, this time at a reunion of the Lindley family, we were persuaded to go back to basics - to John's original plan - and present the songs and verse as a folk cantata. Several folk club appearances ensued in Wollongong, Sydney, Sutherland, Canberra and the festival at Cobargo. And coincidently, at last one of the funding bodies we had approached gave us a seeding grant to enable us to think positively about getting the work recorded. So thanks to the SEARCH Foundation, and to the generosity of the Roaring Forties, our producers, Christina Mimmocchi and David Gilfillan, and the not-for-profit publisher, Feathers and Wedge, the work has at last been recorded. The recording ensemble includes: John Warner, author and composer, singer and multi-instrumentalist; myself Margaret Walters, Jennifer Lees, singer; Tom Hanson, artwork and singer; Robin Connaughton, guitarist and singer; Don Brian whistles and singer; these six all form the group, The Roaring Forties; Christine Wheeler, flute and whistles; Tony Pyrzakowski, artist, fiddle and viola; Matthew Doyle, didjeridoo player; Tony, and Matthew all participated in other presentations of "Yarri"; John Derum, narrator, a new voice in the production - the verses formerly being recited by other members of the ensemble; the decision to have a single voice - a recognised actor - follows an experiment in Gundagai in 2002, the aim being to consolidate the role of the story-teller. Christina Mimmocchi, musical director, editor and producer; David Gilfillan, co-producer, mixing and mastering; and Robin Gist, mixing and mastering, complete the production team. This musical brings people together in a very positive way. 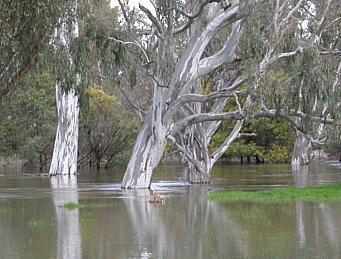 I was very privileged to be involved in the 150 years memorial of the 1852 flood at Gundagai in 2002. It was good to see the school children of the town participating in the play. The musical was very moving and was received very well by all who saw it. The late Pastor Cec Grant, Wongamar OAM, also enjoyed being part of the celebration along with the Wiradjuri people who are very proud of Yarri and Jackey who worked tirelessly to rescue people. The musical tells their story and I whole-heartedly support its promotion. John is a fine folk historian and songwriter with a solid track record of poignant, accurate, moving songs about Australian life and the history of "the folk" (eg his CD, "Pithead in the Fern"). He also has a heart for justice and a sensitivity to all sides of a story. These, plus his attention to details and his canny awareness of drama and irony, make a brilliant marriage with his word-smithing skills and truly singable melodies. With John's songs, I find myself often hit with goose bumps of recognition and the beauty of the images that unfold as the lyrics roll along. Fay White, Singer/Songwriter, Maryborough, Vic. A wonderful production. Congratulations to all performers and thank you for this living memorial to Yarri who saved my great-great grandfather, James Gormly in the 1852 Gundagai flood. My greetings and respect to the Wiradjuri people: I owe my existence to them. Eternal gratitude. It's not often that white Europeans acknowledge and venerate aboriginal people, their spirit, and relationship to the land. Well done for an unusual concept and presentation. Thank you for informing some of us in such a beautiful and moving way. Hopefully more will listen and open their hearts. The best thing I've seen at the folk festival in all the years I've been coming since the first. Wonderful, creative and moving. Tunes and words live in the mind, a wonderful production. An important story and a great contribution to reconciliation.